How does the Ford Kuga ST-Line perform? 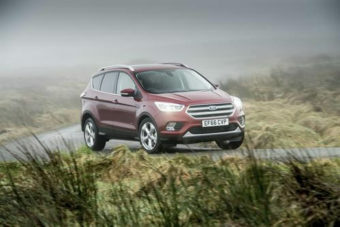 Almost every car manufacturer has a small SUV on sale now, and the Ford Kuga ST-Line is the famous blue oval’s attempt at such a vehicle. The name might sound familiar to you if you’re into cars – the ‘Cougar’ coupe was another Ford launched in the late 90’s. This Kuga has been on sale since 2008, though, and now in its latest third generation, it has received the optional ‘ST-Line’ trim level. This aims to add a sporty look without the drawbacks of sporty running costs. There isn’t usually much to say about small SUVs on the road. They do a job but are never particular involving or enjoyable to drive. That said, they do give a commanding driving position and visibility is usually quite good. 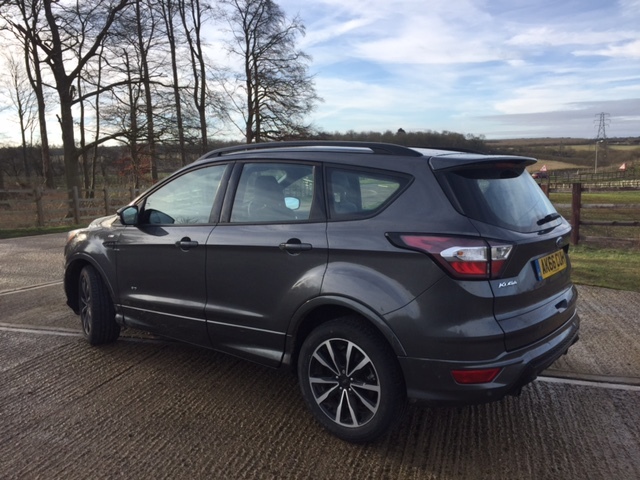 Though the unappealing drive is a common trait of SUVs of this size, the Ford Kuga ST-Line isn’t bad at all. Part of that may be to do with the 10mm lower ‘ST-Line’ suspension, which is also stiffer and more composed. Let’s not forget that the Kuga is built upon the same platform as the excellent Focus, a car that is very good fun to drive indeed. There’s something in the DNA here, that’s for sure. Of course, it helps when you’ve got a decent engine under the bonnet, and the 2.0-litre TDCI turbo diesel unit is solid and just what’s needed in an SUV like this.180PS and 400Nm of torque means overtaking and acceleration is good for an SUV and means you’re not ever really left wanting for more grunt. 62mph takes 9.2-seconds, which is as quick as you really need an SUV to be, and you should be able to achieve over 50mpg if you behave yourself. With the new Kuga ST-Line, buyers have the option of Ford’s ‘Powershift’ automatic gearbox, and it’s worth considering if you are the type of driver who just likes to sit back and enjoy the ride. But, there’s no doubting that the manual gearbox is a fine little box. You can save some money by having the manual gearbox, and this is what we’d recommend. You’ve also now got the choice of running a Kuga ST-Line with all-wheel drive, and we do like the extra security it gives in foul weather and the fact it makes us feel like we’re driving a proper SUV. Sure, fuel economy suffers a bit, but it’s good to have the AWD system there just in case you ever need it. This is probably about as well as small SUV’s drive – at least at this price point. The Ranger Rover Evoque is more comfortable, but that’s in a different bracket. The Kuga is solid, has good steering, and rides and handles just as good as anything below the premium segment. Ford’s ‘ST-Line’ trim level is all about delivering a sportier appearance without putting buyers through the often-expensive ownership and running costs of an actual sporting model. The grill and roof rails on the Kuga ST-Line are black instead of chrome, and there’s a choice of two alloy wheel styles available, but both are again in black. It certainly does a job of making the ST-Line look more aggressive and bolder. There’s a little bit of the presence of the full-blown ST hot-hatchbacks in the styling of the Kuga, even though there’s no ST model of the Kuga. The rear privacy glass and nicely executed ‘ST-Line’ badges on the front wings are a classy touch. Overall you must say the Kuga ST-Line looks more expensive than it is; it’s a handsome car. Climb inside the Kuga ST-Line, and you’ll notice the ST-Line exclusive interior touches. You sit in sporty half-leather ST-Line seats, below an all-black roof lining and there’s lovely contrast stitching on the leather steering wheel, around the gear-lever and on the seats, too. The dashboard also gets its own ST-Line exclusive dark metallic trim, which matches the sporty, dark feel of the overall look. Other exclusive ‘ST-Line’ touches include alloy pedals, a sportier three-spoke steering wheel, and ST-Line branded scuff plates. While it’s my no means a bad fit or finish, the Kuga ST-Line perhaps doesn’t feel as modern as the interior of the Peugeot 3008 GT-Line, nor is it as classy or as luxurious as the inside of an Audi Q3 S-Line – then again, not many are. 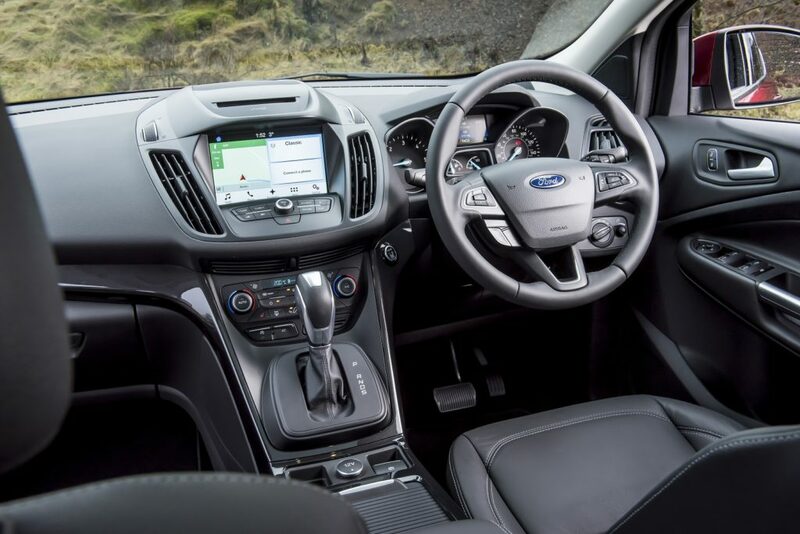 The interior of the Ford Kuga ST-Line is focused upon the eight-inch touchscreen, using Ford’s ‘SYNC3’ infotainment system. It’s certainly step-up in quality over the outgoing SYNC2 system, but it doesn’t always respond that well to fingers, and you sometimes have to press something on the screen more than once. It can be frustrating when you’re on the move, but otherwise, it’s a very nicely displayed and efficient infotainment system. Satellite navigation is usefully included as standard. Away from the screen, the standard Kuga ST-Line can also be equipped with climate control, traffic sign recognition, automatic lights and wipers, and lane keeping assist. There’s also blind-spot monitoring systems, a cross-traffic alert system and a rear-view reversing camera. Practically speaking, the Kuga isn’t bad when it comes to loading capacity. The boot in our test car contains 406-litres with the seats up, but with them folded down capacity increases to over 1,600-litres, so there’s plenty of space to be used if you need it. 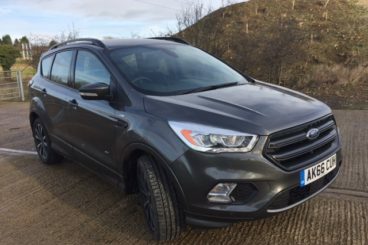 Our Ford Kuga ST-Line 2.0-litre TDCI 180PS AWD is a manual and starts from £32,145. You can get a Kuga ST-Line with a smaller engine and in front-wheel drive only layout, and prices for the Kuga ST-Line generally start at £26,445. Many customers now look at lease deals when seeking to get themselves into a new car. Business customers especially find lease deals good value and it’s possible to get a car the same as we’ve tested for around £230. We also managed to find the model for around £280 a month with the same six months of deposit in advance for personal use customers as well. There’s not an abundance of good handling vehicles in the small SUV sector of the market. The fact that the Kuga ST-Line can handle rather well is a credit to engineers, and it makes it stand out from the crowd. That ST-Line suspension works! The outgoing Kuga didn’t really do itself any favours looks wise, with a front end that seemed a bit like a much earlier Ford Focus. This generation takes styling cues from the Ford Edge, a bolder more imposing look and it looks far smarter, especially with the ST-Line touches. In our review of the Focus ST-Line – the Kuga’s sibling – we criticised it for having poor equipment levels, but in the Kuga, that’s not the case. It has a strong selection of equipment, meaning it will stay modern for longer, as well as be easier to use. Ford has made a choice about how they want the Kuga ST-Line to handle on the road, and by stiffening the suspension they’ve made the car one of the best handling small SUVs. There is always a trade-off, though, and that is that some of the comforts have been taken away. You’ll feel more bumps in the ST-Line than in other trim levels of Kuga. The SYNC3 infotainment system is better than the outgoing SYNC2, but it still suffers from being stashed behind a slightly unresponsive touchscreen. At some point, you may find yourself getting frustrated with it. It costs around £1,000 to upgrade to the ‘Powershift’ automatic gearbox, and we’d say that unless you really want an automatic gearbox, save your money and stick with the manual. The Powershift gearbox is competent but doesn’t set the world on fire. There’s a trait amongst manufacturers really starting to take off – the sporty looking ‘Line’ trim levels. Our Ford Kuga ST-Line has competition from the Peugeot 3008 and Audi Q3, who also have their own sporty-edged trim levels to lure customers in. It’s becoming more of a family vs family feud than a model vs model fight. What do we prefer, though? Let’s take a closer look. From the outset, you can see that there’s two drastically different design styles going on between these two cars. Ford has gone down the route of making the Kuga ST-Line look smart and aspirational, while Peugeot has let its designers go totally wild with an artistic, conceptual final design that looks far more like something you’d see at a motor show than out on the road. What customers will prefer will be down to personal taste, but there can be no doubting that the Peugeot 3008 GT-Line has the edge in overall quality; the styling looks more expensive on the outside, but inside the futuristic dashboard design and quality materials feel more special. The addition of the Peugeot digital cockpit display only heightens this feeling of superiority and modernity inside. We also like the scented air vents, a little touch of luxury. The two cars drive similarly in that they are both on the firm side, but this is becoming a bit of a trend when it comes to small SUV handling and driving characteristics. We’d still give the Kuga ST-Line the edge when it comes to having an enjoyable drive though, and it has around 30PS more than the 3008 GT-Line, so there’s extra punch available when compared with the French contender’s 2.0-litre diesel. Finally, the Peugeot 3008 also has the edge in practicality with a larger boot space at 591-litres with the seats up, and 1,670-litres with the seats down. The front passenger seat also folds flat, so if you’ve ever got any long items, the Peugeot will cope with them more comfortably than the Ford. If you’re the type of person who values the finer things in life, the chances are you’re going to be interested in spending a bit more money and opting for an Audi Q3 S-Line. The Q3 is a very successful small SUV and when it comes to driveway posing, it’s pretty much as good as it gets. It’s the small SUV that’ll make neighbours jealous, and believe it or not, lots of people do think that way! The Q3 S-Line is a premium product, and you only have to look at the pricing to see that it is aimed at more affluent buyers. The equivalent Q3 S-Line to our Kuga ST-Line is over £35,000, which isn’t a huge amount more than the Kuga, but it should be pointed out that Audi buyers are expected to spend far more on options to obtain a similar or better spec. It’s comfortable and composed on the road, and Audi interiors are better designed and executed as just about anything else on the market, so it certainly feels premium. Its 184PS 2.0-litre diesel engine is smoother than Ford and Peugeot’s efforts, and mated to the ‘S-Tronic’ automatic gearbox, it is the slickest combination in our test. Overall, the Audi Q3 S-Line is a mighty fine car, but it could cost you an arm and a leg if you’re not easy on the options. For some people, it might just be too expensive to justify. 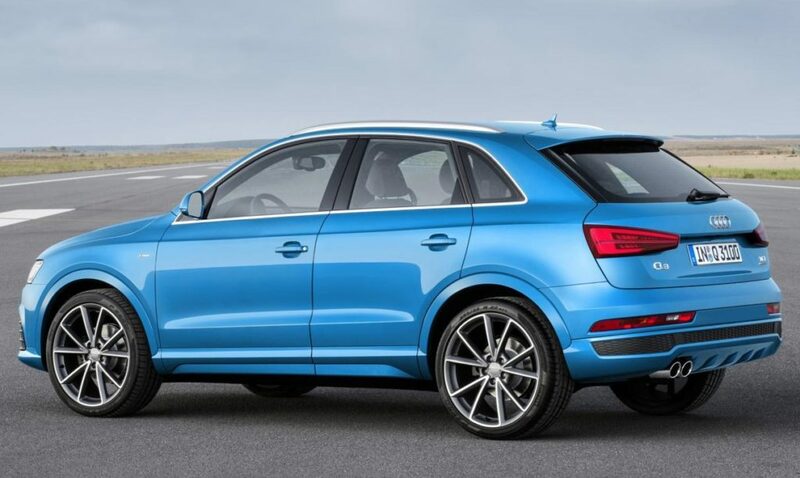 Get carried away with the options list, and it’s quite easy to spend over £40,000 on an Audi Q3 S-Line. In a way, that almost rules it out altogether on this test, but we can’t deny that it’s a fine car and if your budget can stretch to one, we’re sure you won’t be disappointed. However, in the here and now, the Peugeot 3008 GT-Line represents the best value. It’s possible to restrict spending in the 20’s rather than the 30’s with the French SUV, and it certainly has the most modern and striking design. It may be down on power slightly and not the best to drive, but SUV driving dynamics aren’t meant to be exploited. 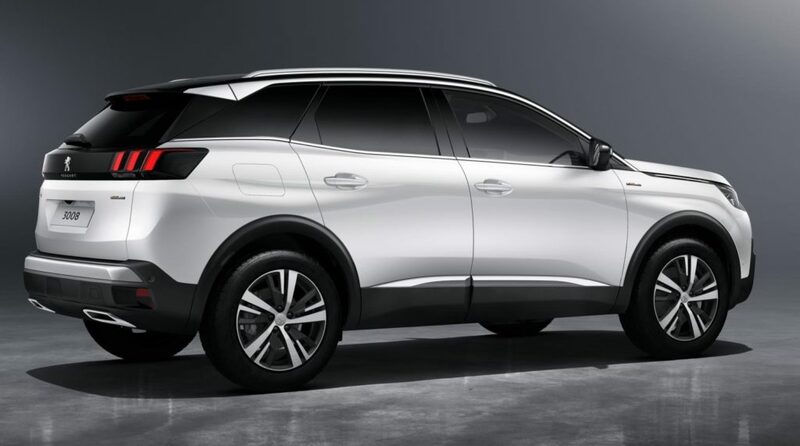 If you want something striking, comfortable, and spacious, the Peugeot 3008 GT-Line is probably your best bet.